Just as Latin America represents a fraction of global solar demand but is growing rapidly, the Caribbean market makes up about 2 percent of Latin America’s market, but is quickly expanding from its small base. So why should you care about this tiny solar market? GTM Research and Meister Consultants Group recently partnered to survey 30 solar companies active across the Caribbean region. Released today, Solar PV in the Caribbean: Opportunities and Challenges is a free white paper summarizing the findings from the recent survey. Here are four facts you should know. 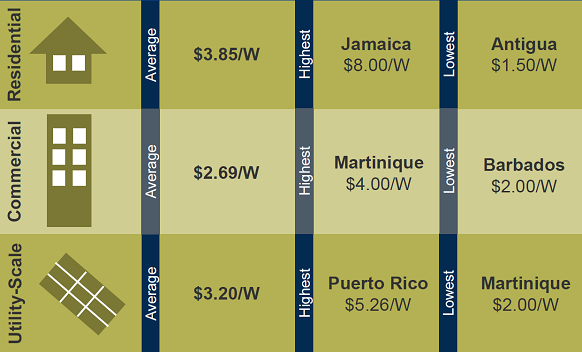 Across the Caribbean, the average cost to install a residential system is $3.85 per watt. However, depending on the island, costs range from as low as $1.50 per watt in Antigua to as high as $8.00 per watt in Jamaica. However, even within Jamaica, costs varied, as some reported prices were as low as $2.50 per watt. Commercial system costs in the Caribbean averaged $2.88 per watt. According to the report, these costs are lower due to multiple project bids, economies of scale when compared to the residential segment, and better access to capital. GTM Research and Meister Consultants Group found that financing terms in the Caribbean typically require collateral, have interest rates ranging from 7 percent to 20 percent, and typical tenors of three to five years. The report finds that the high costs of capital and short debt terms are constraining market growth and weakening PV economics. The white paper details system pricing by market and segment, module pricing, equipment brand recognition, and policies by market. Download it for free here. Category/ies:Anguilla Articles, Articles, Barbados Articles, Jamaica Articles, Regional Articles.